Over Christmas I casually asked my son 'what kind of party do you want for your birthday?'. Silly me thought he wouldn't understand the question. Wrong. He is my child. Of course he knows what a party theme is. 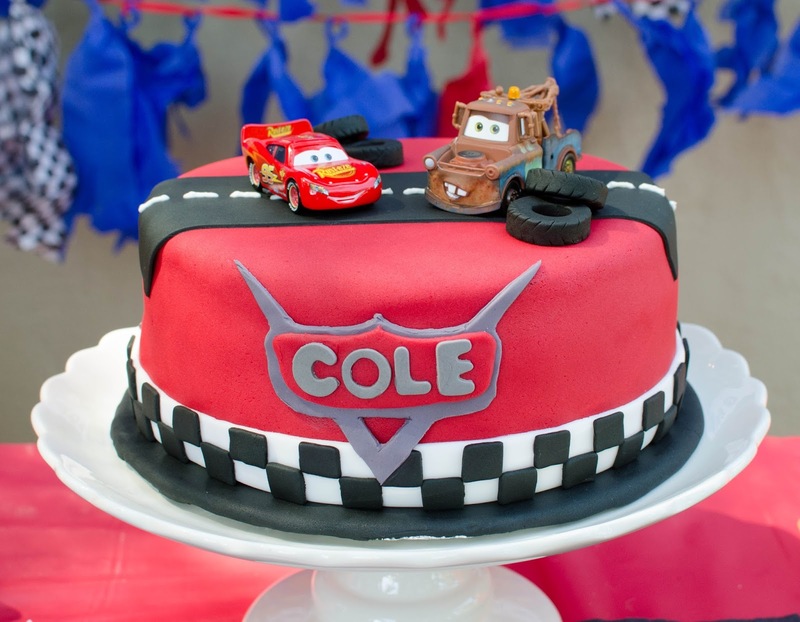 He paused, very carefully considered this question, then answered 'A Lightning McQueen birthday party!' And there you have it. It could have been worse. At first I was a little sad that I didn't get to pick anymore, but then I realized that I now knew exactly what would delight him on his special day. 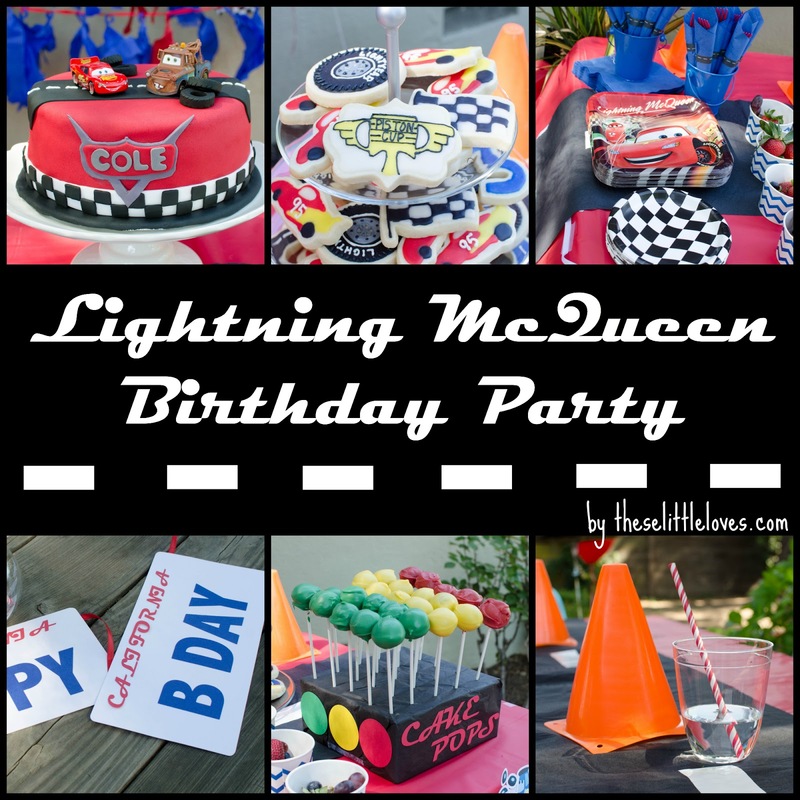 And although technically a licensed character party, it didn't mean I had to plaster Lightning's face on every single party supply. So I looked for a little inspiration. I found it in the grocery checkout aisle, oddly enough. For about a year and a half my son has asked for a Lightning balloon almost every time we go to the grocery store. The grocery store owners, in their plan to make checking out a constant parenting battle (candy, balloons, movies...come on! ), place balloons at the checkout lines. My son's favorite happens to be a giant balloon of Lightning in all his bright red glory against a blue backdrop. Color scheme...check. Or should I say KaChow? Red and blue, with a little black and white check pattern thrown in for good measure. And I could finally have an excuse to delight my little one with his favorite balloon. In fact, this balloon is still keeping us company, floating beside his trusty sidekick Mater in our living room. With the color scheme settled, I ordered a host of adorable party supplies. I picked one item with Lightning's face and the rest was in the solid colors of the party theme. Just enough, but not overdone. See those checkered flag cups? They get a sweet personalization later. Just wait until we get to the party favors! Next came the invitations. It should be no surprise that I am usually a DIY invitation kind of person. However, my limited artistic skills stop far short of being able to draw a convincing Lightning McQueen. 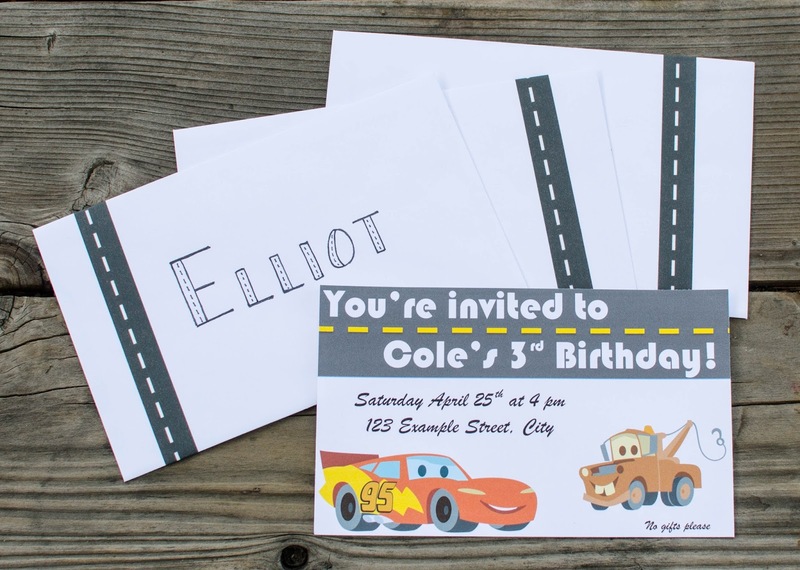 Instead, I found some adorable cars artwork on Etsy for use on the invitations and a cars garland that might just get its very own blog post. As is my party custom, I bought a special washi tape for envelope decoration, this time in a road pattern. To keep the party from being a visual assault of Lightning's face, I brainstormed other elements to complement the theme. It turns out there was a lot to choose from: tires, license plates, Route 66 signs, checkered flags, traffic cones, roads. I picked two and got started. Just kidding. I used all of them. Why not? 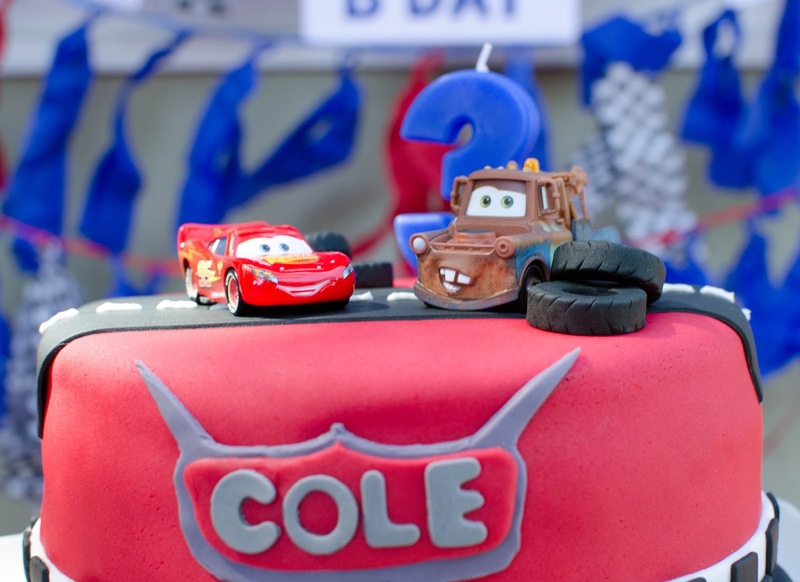 Tire and license plate garlands complemented the cars character garland perfectly. 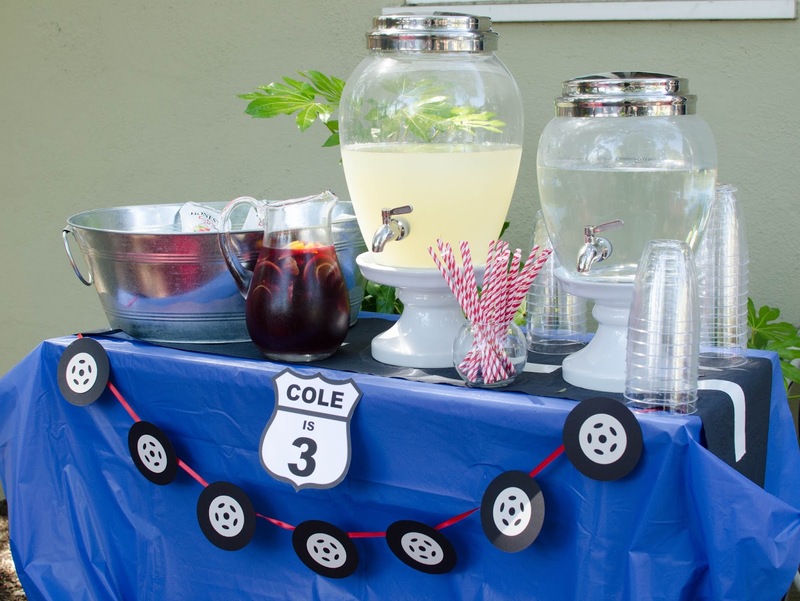 Route 66 signs were altered to say 'Cole is 3' and placed around the yard as decoration. 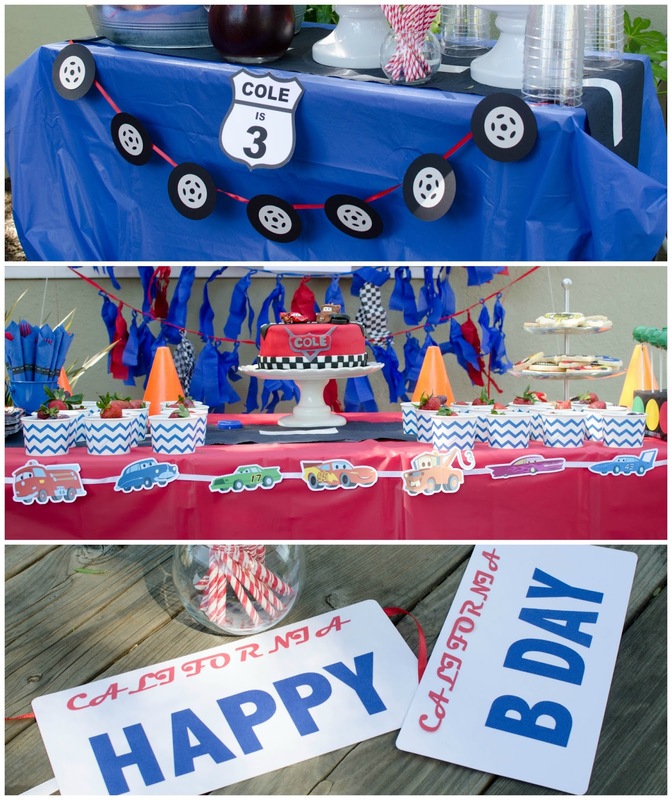 All the tables were covered with red and blue table covers to which I added DIY road table runners and traffic cones (or 'cozy cones' as my sons calls them). I made 4 of the road table runners for a whopping $5! Taking a black paper table cover, I cut it into 4 long strips and then added pieces of white duct tape. Big impact for a small price. 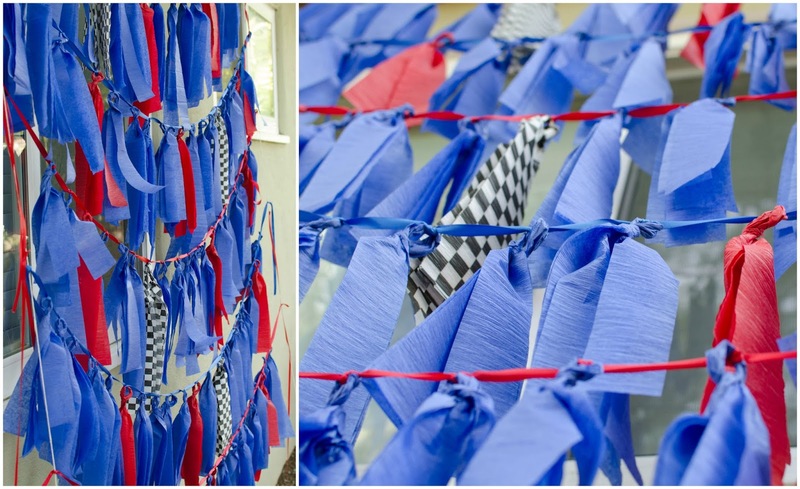 Checkered flags were added in small doses to the party. Dessert plates, favor cups, and as part of the crepe paper backdrop for the dessert table. 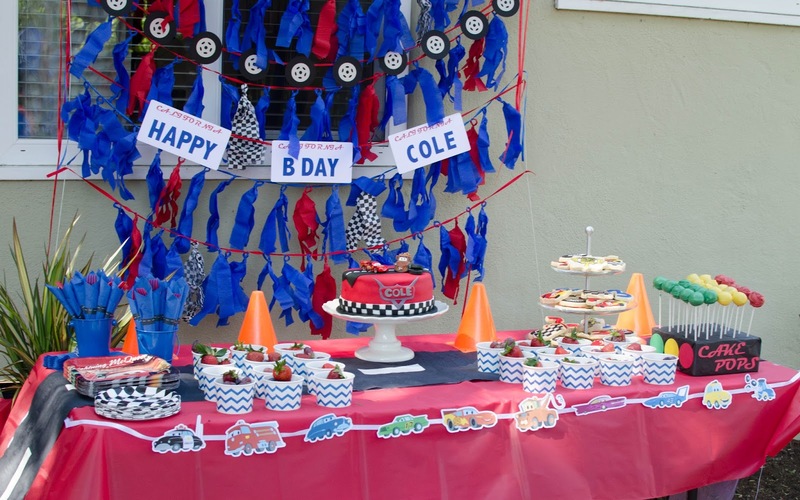 I made five strands of crepe paper garlands to form the backdrop for the dessert table. In hindsight I would have either made 4 more full garlands or added three more. 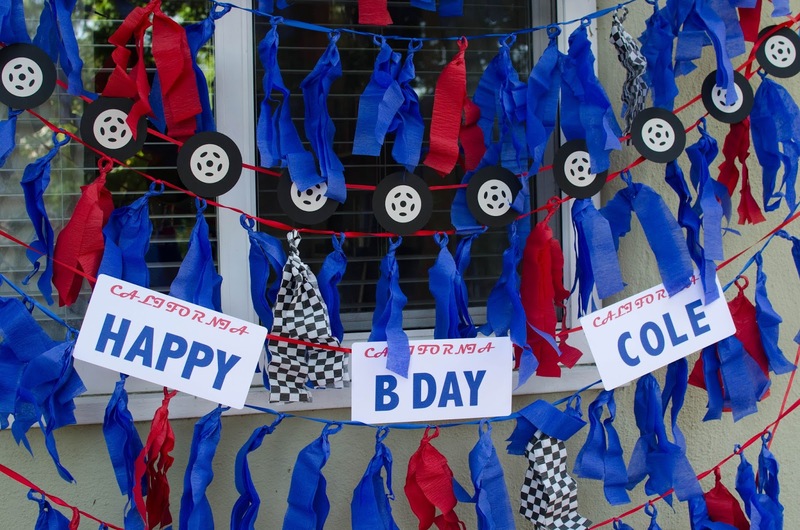 The effect was fun and festive, however, and looked great on the invariably windy day that is always Cole's birthday. We had fresh fruit (strawberries, grapes, blueberries) portioned out into blue chevron treat cups. 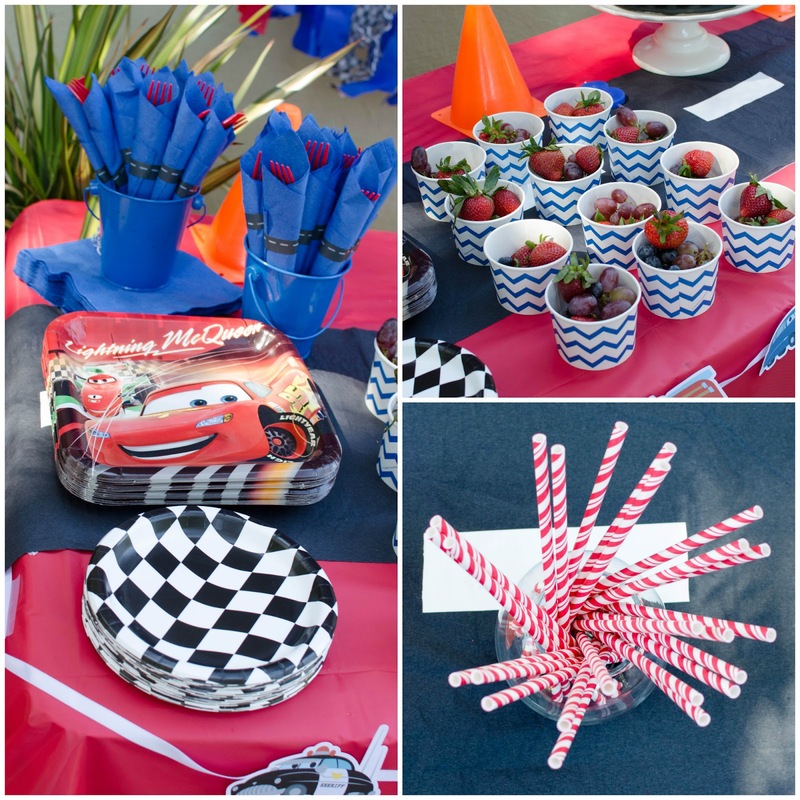 Red forks wrapped in blue napkins with road washi tape rings sat in blue metal pails, while Lightning McQueen and checkered flag plates provided large and small options for guests. 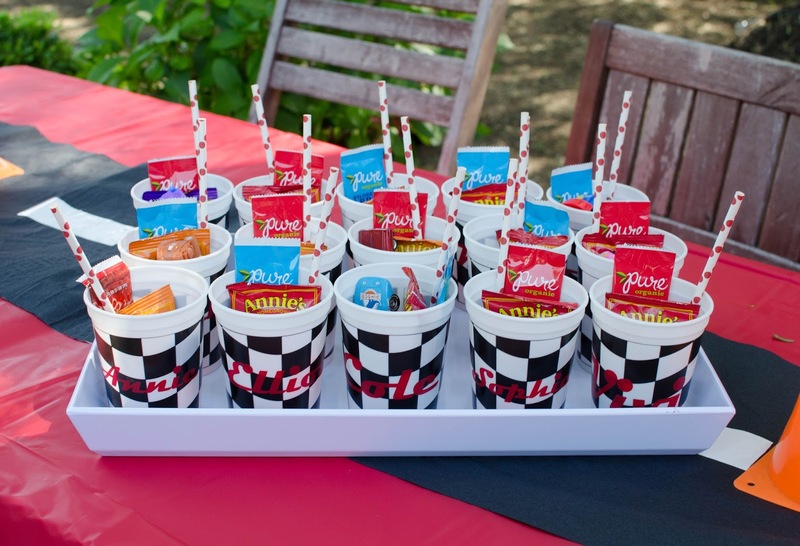 The red and white striped straws were the perfect touch to the cups I order for every party. The party was set in the afternoon from 3-5, so the menu was kept fairly simple. For snacks we provided fresh fruit and feta/caramelized onion tarts from Trader Joe's (always a party favorite). Dessert were my standard go-to lineup of Mexican chocolate cake (also in cake pop form) and the best sugar cookies you have ever tasted. My son delighted in the cake more than I could have hoped for. He is still talking about it. It didn't hurt that it had two new surprise cars on the top as a gift! He loved the road and the tires and the 'cars sign' (as he calls it). I loved how bright and graphic it turned out. A blue '3' candle was the final touch. It turns out that cake pops are my baking cryptonite. I am convinced that those beautifully decorated and smooth cake pops are created in a lab somewhere by an evil villain bent on making bakers feel inferior. I just can't seem to get it right. Sugar cookies and fondant cakes, I can handle. Cake pops keep me humble. At least they taste good! I got over my frustration with them and served them anyway. The traffic light idea was too cute to pass up. 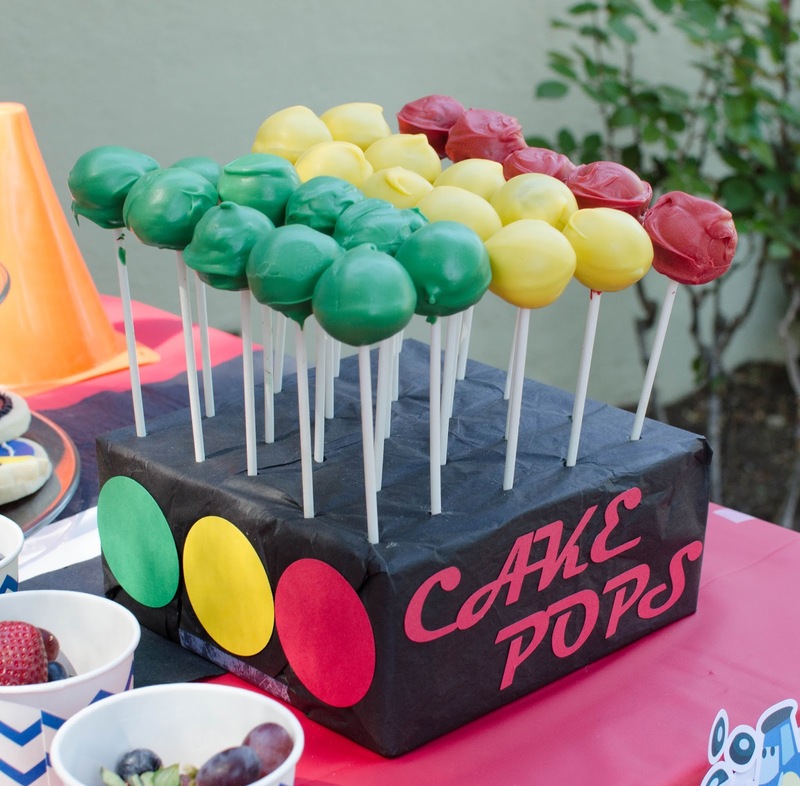 Florist foam bricks covered in tissue paper served as an inexpensive alternative to a cake pop holder. And now the sugar cookies. Ah, the sugar cookies. Sometimes these stress me out worrying that the decorations won't turn out like I picture them in my head. This time, it was pure fun. 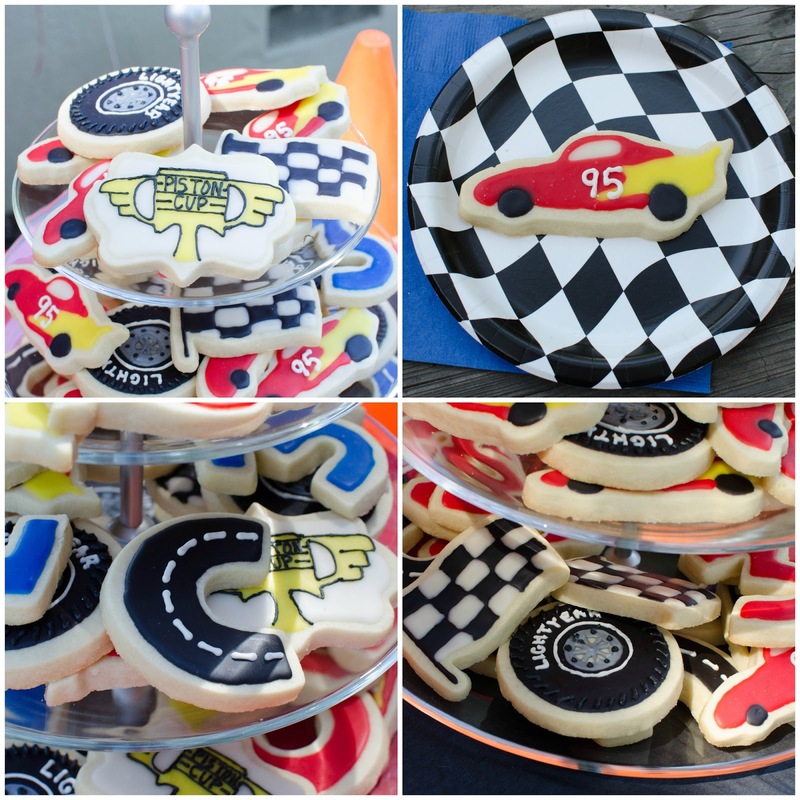 We had Lightning cookies, tires, checkered flags, Cs made into roads, red and blue 3s, and even a few piston cup cookies. Drinks were also kept simple with water, lemonade, juice boxes, and Sangria (for the adults). Perhaps the best decision I made in planning this party was the entertainment. 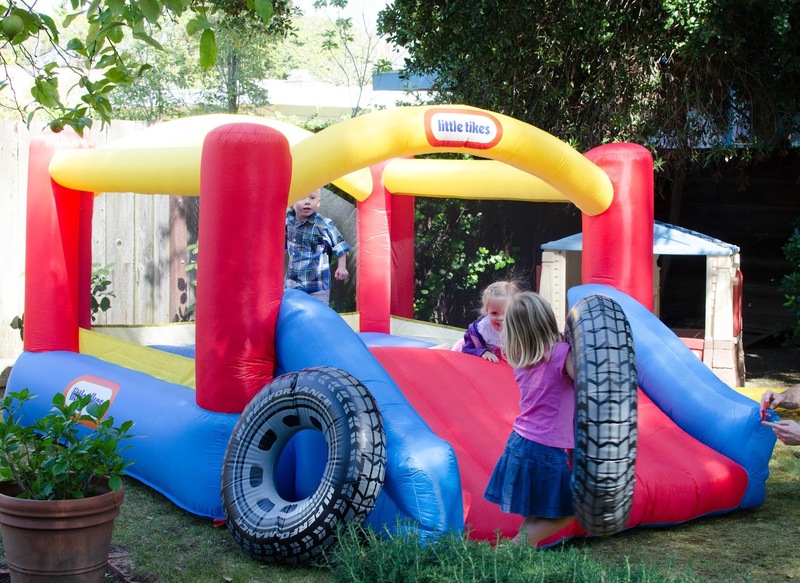 We purchased a Bounce House from amazon to serve as dual party entertainment and a birthday gift. Win win. This might just be the best $180 I have ever spent. 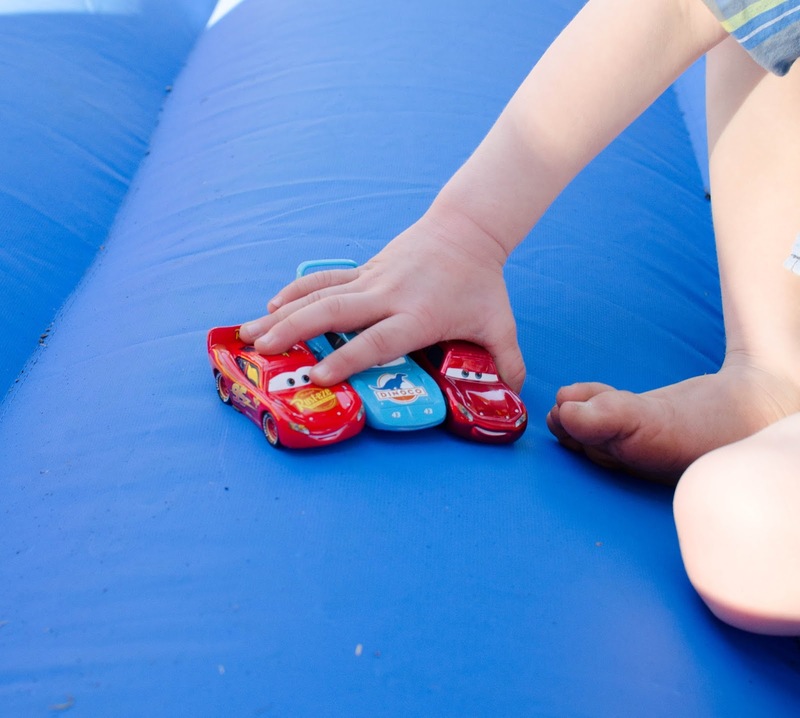 The kids were fully entertained for the whole party and it stores up in a bag to be pulled out easily for any play date or party. Well worth the money in my opinion. In fact, I'm pulling it out next week for a random play date on a Wednesday. 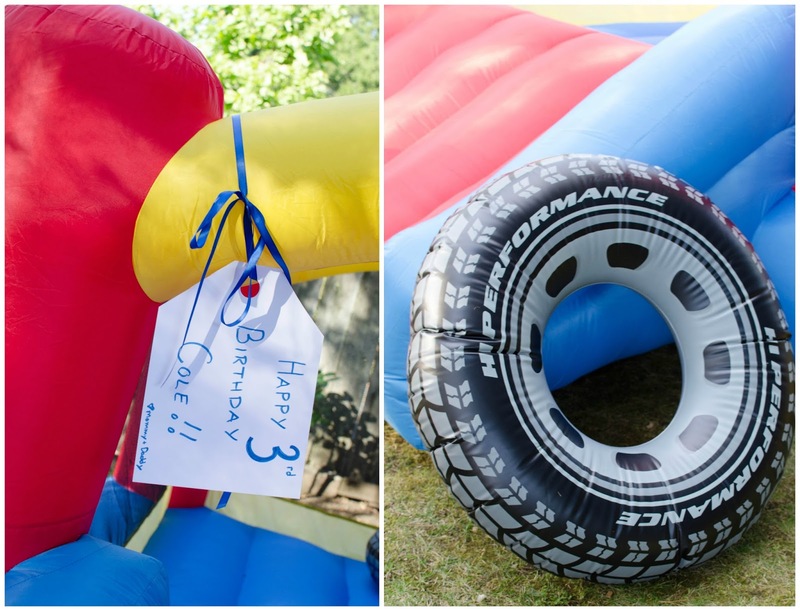 We threw in a few inflatable tires and the kids went nuts. 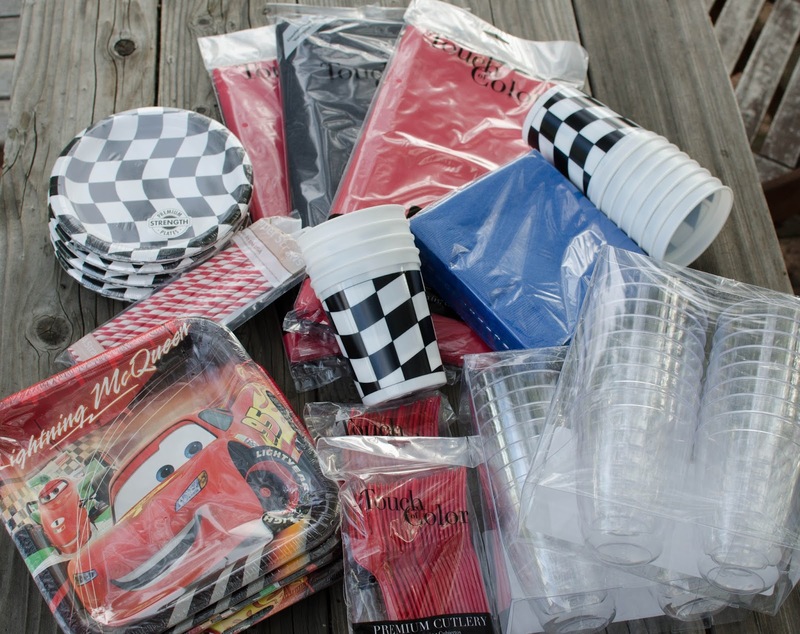 Remember those checkered flag cups from earlier? 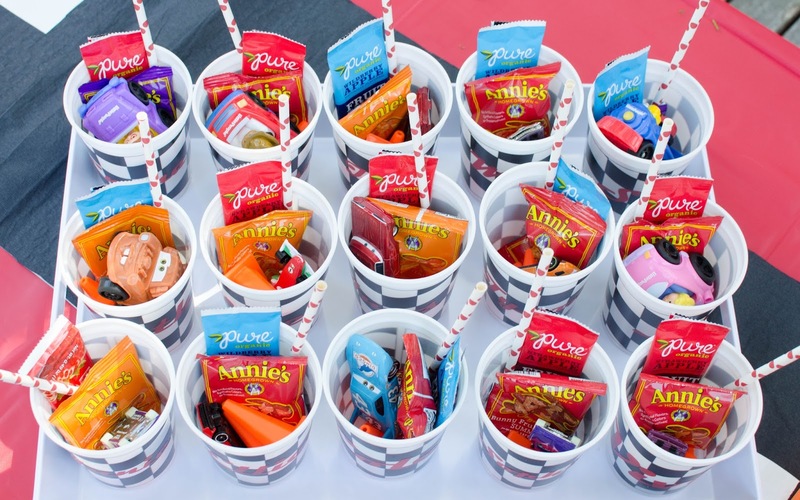 They made the cutest personalized favor cups for the kids. I cut red vinyl with my Silhouette Cameo with each kids name in a free Cars font (Magneto) I found online! 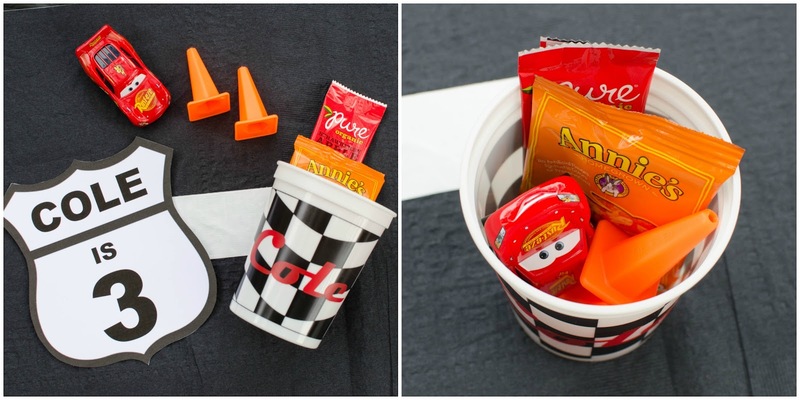 Each cup held a toy car, tiny traffic cones, a fun straw, gummy snacks, and fruit leathers. 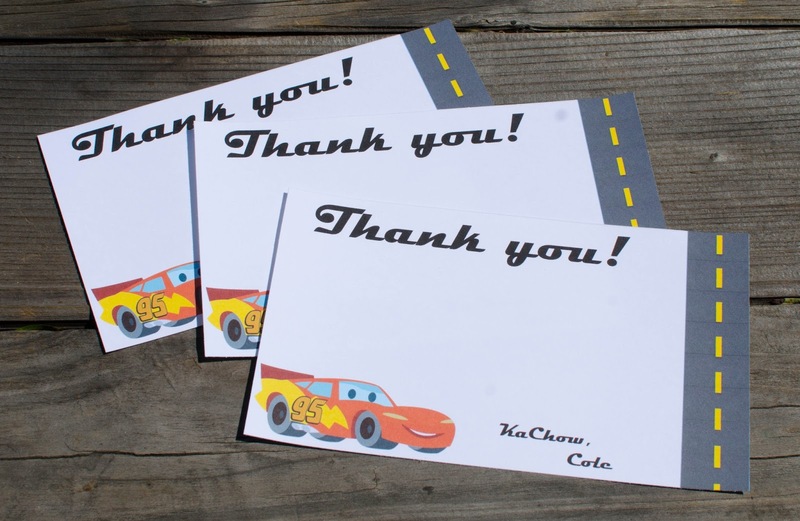 And finally, I tweaked the invitations to make a few thank you cards. As I write this post, I feel as if the party details are fun and happy, but pale in comparison to the joy I felt that day. My son delighted in everything. He got it. I won't ever forget the smile on his face as people sang him Happy Birthday. Three might just be the perfect age for a birthday.